Standing in the massive hangar of Tillamook’s air museum and looking up through the cavernous stillness to the ceiling some 192 feet above leaves no room for doubt. This is the cathedral of the Oregon Coast. But this cathedral is not carved from stone and nor does it honor any god or king. Rather, this magnificent structure stands as a monument to the ingenuity of the men who built it almost entirely from wood in nine rain-drenched months in a nation at war and under siege. 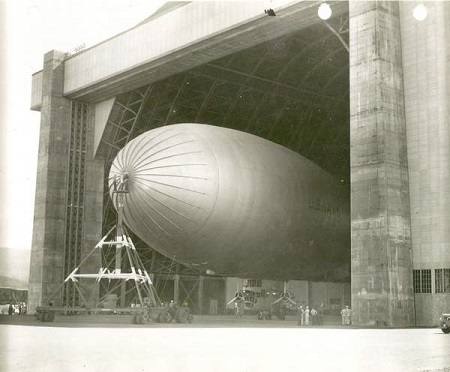 Finished in 1943, the hangar was one of two constructed at the Tillamook Naval Air Station to house K Class surveillance blimps tasked with spotting Japanese submarines. A K Class blimp noses its way out of Tillamook’s Hangar B. In concert with their German allies in the Atlantic, subs from the Imperial Japanese Navy were playing havoc with US supply lines, destroying some 454 merchant ships in the year before the blimp program became active. The next year, with blimps patrolling from both the East and West coasts, that number dropped to about 40. “They had an incredible track record,” said air museum curator Christian Gurling. Covering an area the size of seven football pitches, the hangar provided a safe harbor for up to eight of the massive blimps at a time. 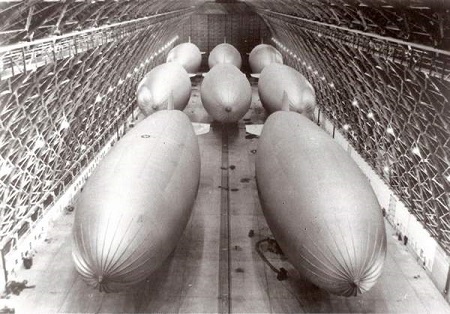 Each blimp was crewed by a team of 10, who would scour the ocean surface for signs of submarine periscopes; staying aloft for up to three days at a time as they escorted convoys and patrolled the coast. The crews would work, eat and sleep in 40-foot gondolas that, despite being the size of a bus, were dwarfed by the 252-foot-long, 80-foot-diameter balloon above. To house these vast vessels, the US Navy commissioned a network of 17 blimp hangars on the East and West coasts — an effort that required huge amounts of manpower. “They were advertising all the way out in the Midwest, looking for workers to come out and build these hangars,” Gurling said. That industriousness paid off, with Tillamook’s second and equally gargantuan hangar being completed in just 27 days. Hangar A, as it was called, burned down in 1992, leaving Hangar B as one of just seven surviving blimp program hangars in the nation and the only one that is open to the public. Having housed the air museum since 1994, Hangar B is now in the midst of reinventing itself following the decision by airplane collector Jack Erickson to relocate his ’planes to Madras, Oregon. The Port of Tillamook Bay, which had leased the building to Erickson, has stepped in to manage the facility, officially called the Naval Air Station Tillamook Museum. 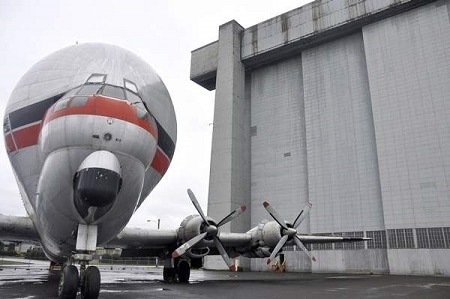 The Aerospacelines Mini Guppy is the one remaining Jack Erickson airplane still on display at the museum, largely due to the fact that it is almost impossible to move. 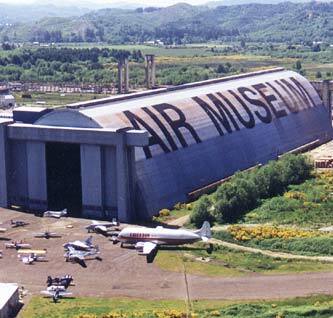 The ’plane is currently set to remain at the site through at least 2016. The museum’s new executive director, Liz Marcum, said bringing in new aircraft to complement the current display of about 20 ’planes and helicopters is just one of several items in her in tray. In her previous role at Portland’s Pittock Mansion museum, Marcum developed a program of behind-the-scenes tours — an idea that she and Gurling have adapted for the air museum. The first tour took place earlier this month, giving visitors the chance to see all kinds of nooks and crannies, including ladders that run up inside each of the concrete columns to the roof and an old utility tunnel that used to connect Hangar B to its ill-fated sister building. “You can see really what happened here in the ’40s when the navy was here,” Marcum said. Marcum also plans to bring in rotating exhibits, either developed by the air museum or on loan from other institutions. Staff are currently working on an exhibit about the construction of the hangar itself, sorting through thousands of photos on loan from the Tillamook County Pioneer Museum. 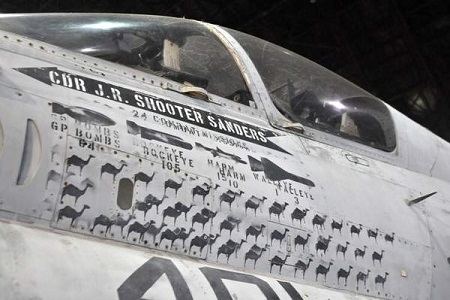 This A-7 Corsair II flew 39 missions in the first gulf war, each one represented by a camel stenciled on the side, along with tallies of the ordinance deployed. Thinking big — really big — Marcum is also hoping to restore one of the K Class blimps for display within the hangar and is looking into the idea of having a replica gondola constructed to give visitors an idea of the crew’s working conditions. Gurling said the hangar, unmissable with its 100-foot-tall letters, has always done a good job of drawing in visitors from Highway 101. And with historical buildings comes maintenance — and lots of it. With a roof that spans more than 11 acres, it comes as little surprise that there are a few leaks here and there, although nothing that is causing any damage to the exhibits. A more pressing problem is the hangar’s doors, which have deteriorated to the point that staff are only opening them when absolutely necessary. With each of the six doors weighing somewhere between 30 and 42 tons apiece, repairs are a major job and one for which the museum is seeking grants. Gurling said he is amazed that the wooden structure has stood up so well in the face of 72 years of Oregon Coast weather. While some of the other blimp hangars across the country fell into neglect, Tillamook’s hangars were fortunate to be in pretty much constant use after World War II came to an end in 1945. 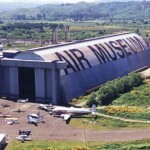 For the first few years after the war, both buildings were used to store surplus aircraft, which were flown in from all over the world and crammed into the cavernous structures. After the Navy pulled out of Tillamook in 1948, the County took on responsibility for the buildings, famously staging a 1950 air show during which two pilots flew their AT6 Texans right through Hangar B. The vast buildings went on to find various other tenants, including lumber companies and aircraft developers. In 1992, acting as a hay silo proved to be the undoing of Hangar A, which burned to the ground after a fire of unknown origin swept quickly through the 130,000 bales and destroyed the building’s wood skeleton. Hangar B is now listed on the National Register of Historic Places and preserving the iconic building is a top priority for the museum staff. Gurling said many area residents have fond memories of the structure, including one of the museum volunteers who used to sneak into the old building, climb the stairs and run the length of the catwalks, 137 feet above the hangar floor. “To think about losing something like that would break people’s hearts,” he said. Naval Air Station Tillamook Museum is located just south of Tillamook on Hangar Road. If you miss it, you really shouldn’t be driving. It is open from 9 am to 5 pm daily. Admission is $9 for adults; $8 for seniors; $7 for active or retired military. A $25 family ticket is good for two adults and two youth. For more information, go to www.tillamookair.com. 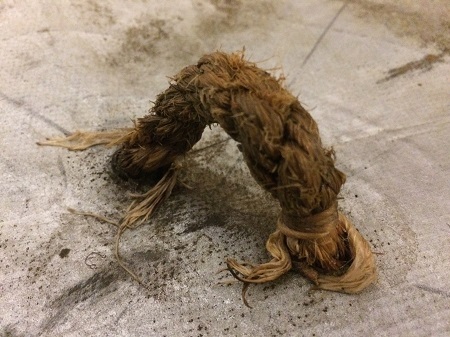 In preparing one of the “behind-the-scenes” tours, museum curator Christian Gurling made an amazing discovery. 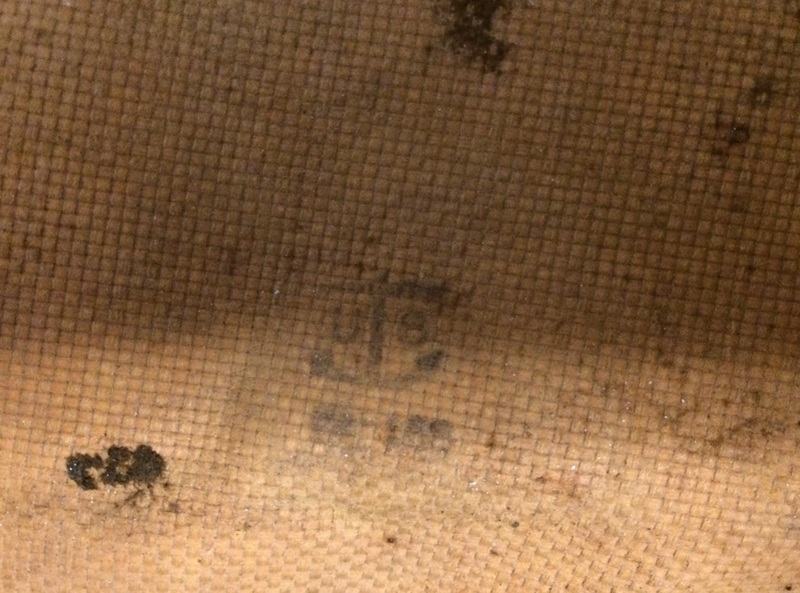 Piece offabric, probably from a 1940’s Navy blimp. Draped high up between the rafters there was, what appears to be, a piece of 1940s-vintage rubberized cotton airship envelope material. 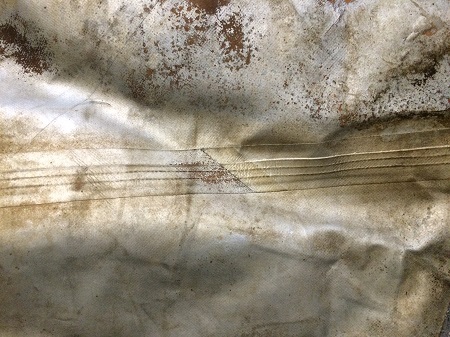 On the back side of the fabric there is a U.S. Navy Anchor stamp. Gurling is now trying to discover why this piece of fabric was up there. There are no inscriptions on the fabric other than a Navy anchor. 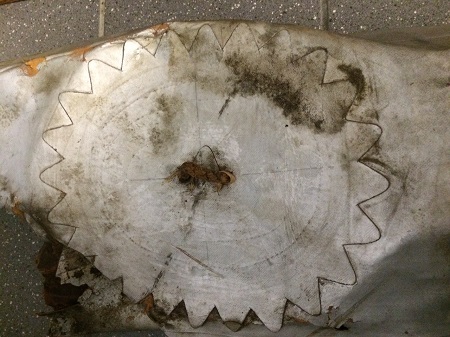 The piece appears to have been neatly cut, suggesting this was intentional. 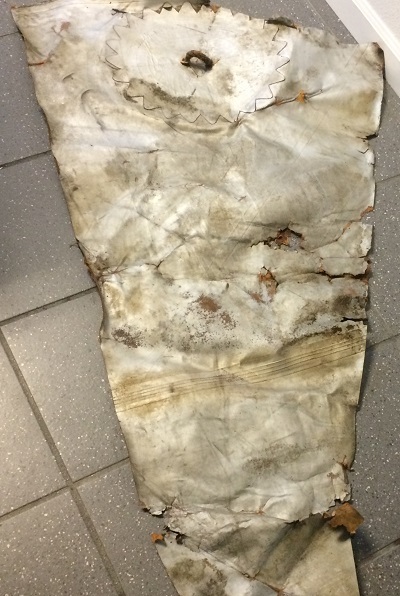 Can you help us identify this piece of fabric? Contact us if you have any information. This entry was posted in Hangars and Sheds, Museum and tagged blimp, Blimp Hangar, Christian Gurling, Hangar B, Liz Marcum, Naval Air Station Tillamook Museum. Bookmark the permalink.